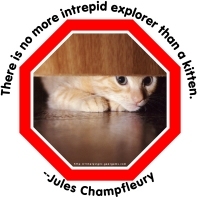 “There is no more intrepid explorer than a kitten.” This succinct quote by Jules Champfleury is accompanied by a photo of a precious itty-bitty orange kitty peeking under a door, and framed in a red octagon reminicent of a STOP sign. What cat lover could resist such a picture? Get this great design on a t-shirt, sweatshirt, bag, clock, mug or any other quality gift or appareal item for the ailurophile in your life, exclusively from GearGems!